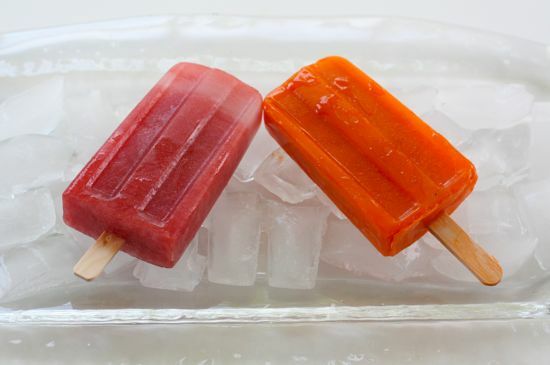 I’m talking ice pops, adult-style, with sophisticated flavors like the Thai iced tea and agua fresca pops pictured here. You can share them with the kids but you’ll be tempted to hoard them for yourself. Making ice pops (Popsicle is trademarked and off-limits) may be one of the simplest tasks in the kitchen. You can’t really call it cooking. All you need is a blender or food processor and molds, which are available everywhere right now. If you don’t want molds taking up space in your cupboards all year, paper cups and wooden craft sticks will do the trick. Whirl the ingredients together in the blender, pour them into molds and freeze. Let the mixture get a little slushy in the freezer before you add the sticks. That’s it. Just be sure to allow plenty of time for the pops to freeze firmly. Overnight is best. These frozen treats pay tribute to Latin American and Southeast Asia. They may require side trips to ethnic markets but the flavor is worth it. If you’d prefer your ice pops with a little kick, though, try these from a previous post. Remove watermelon flesh from rind and cut roughly into chunks about 2 inches square. Place in blender and add the Jamaica tea. 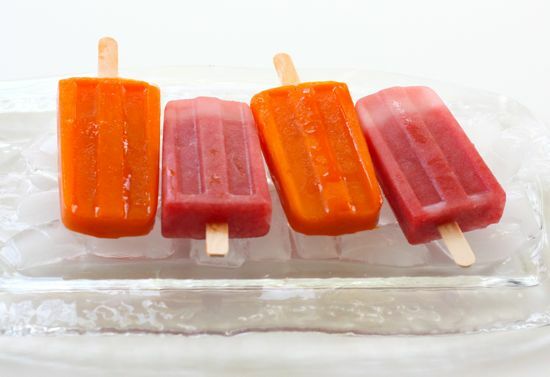 Whirl until well-blended, pour into ice pop molds and freeze. Note: Jamaica concentrate is available in the coffee and tea aisle at Mexican grocers. Mix 1 tablespoon of the concentrate with enough water to make 3/4 cup. Alternatively, steep 1/3 cup dried hibiscus flowers, which are more difficult to find, for 2 hours in 1 cup boiling water and strain, pressing on leaves to extract as much liquid as possible. Add 1 or 2 tablespoons of sugar to taste. Bring water to a boil. Place tea in medium saucepan or large Pyrex cup. Pour water over tea, stir and let steep for 3-5 minutes. Tea should be a dark reddish orange. Strain tea into a clean container through a coffee filter or strainer lined with several layers of cheesecloth into a clean container. Add sugar, stirring to dissolve. Add condensed milk and whisk to blend thoroughly. Tea will become a milky orange. Let cool to room temperature, pour into molds and freeze for at least 6 hours. Note: Thai tea is sold in many Asian markets. Man, that Thai Iced Tea pop sounds awesome. It gets good and hot around here! This is on my list!